The HTT-40 (Hindustan Turbo Trainer-40) basic training aircraft will enter service with the Indian Air Force. Image courtesy of Anirvan Shukla. The basic training aircraft is being developed indigenously by state-owned Hindustan Aeronautics Limited (HAL). Image courtesy of Ministère de la Défense. The HTT-40 is powered by Honeywell TPE331 series engine. Image courtesy of Hustvedt. HTT-40 (Hindustan Turbo Trainer-40) is a new basic training aircraft being developed by Hindustan Aeronautics Limited (HAL) for the Indian Air Force (IAF). The new aircraft will replace the ageing fleet of HAL HPT-32 Deepak trainers that are in service with the IAF. The aircraft will be primarily used for basic flight training, aerobatics, instrument flying and close-formation flights, whereas its secondary roles will include navigation and night-flying. The first prototype of HTT-40 Trainer was rolled out from the Aircraft Research and Design Centre (ARDC) hangar, in February 2016. The HTT-40 trainer made its first flight in May 2016. 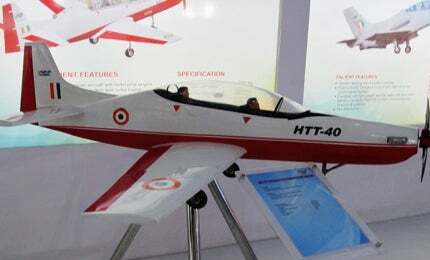 The HTT-40 project was conceptualised by HAL to fulfil the IAF’s requirement of 181 trainer aircraft. Due to the HTT-40’s development delays, the air force placed an order in May 2012 for 75 Pilatus PC-7 Mk II turboprop trainers to meet its urgent operational requirements. "The HTT-40 trainer made its first flight in May 2016." The Indian Ministry of Defence chose to procure 38 Pilatus trainers to replace its old trainer aircraft fleet in February 2015, while the remaining 68 aircraft will be sourced from HAL. HAL completed works on ground test air-frame and also produced several air-frame structures for the first aircraft by mid-2015. The aircraft is projected to enter production by 2018. The serial production will start at HAL’s transport aircraft division (TAD) in Kanpur, India. The HTT-40 is a fixed-wing aircraft incorporating an all-metal airframe design. It features a bubble canopy, T-tail configuration and a retractable tricycle landing gear system with a steerable nose wheel. Yak-152 is a new-generation primary trainer aircraft being developed by Yakovlev Design Bureau, a part of Irkut Corporation. It has a maximum take-off weight of 2,800kg and can be configured to carry a gun, rockets and bombs to perform light combat and counter-insurgency missions. The air-conditioned, glass cockpit accommodates two crew, including an instructor and trainee in tandem seating configuration with zero-zero ejection seats. It integrates multi-function displays, and modern navigation and communication systems. In June 2015, Honeywell was selected by HAL to supply the TPE331-12B turboprop engines for the high-performance HTT-40 military trainer aircraft. The TPE331-12B turboprop engine, equipped with full-authority digital engine control (FADEC) system, develops a maximum power output of 950 shaft horsepower (shp). It is one of the most widely-employed turboprop power-plants in operation. It enables the HTT-40 to offer users quick acceleration, low-fuel consumption, high-reliability and the flexibility to conduct a range of training missions. The reliable turboprop engine also allows HAL to develop a range of variants that will deliver increased levels of performance. Honeywell has delivered more than 13,000 TPE331 engines to both military and civil operators worldwide. The fleet of TPE331 engines accumulated more than 122 million flight hours to date. The engines power a range of aircraft, including light aircraft and advanced unmanned aerial vehicles (UAVs). The HTT-40 trainer offers the best-in-class fuel economy and power rating. It takes-off from a short distance and has a high rate of climb. It has a maximum speed of 450km/h and can reach a maximum distance of 1,000km. The stall speed with flaps down is 135km/h. The certified operational ceiling of the trainer is 6,000m, the ‘G’ limits are +6/-3 and airborne endurance is three hours.